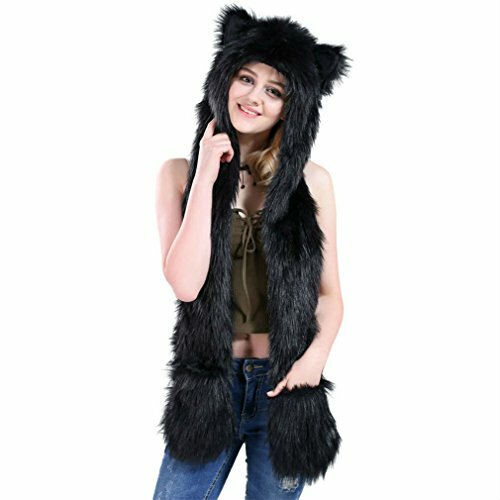 A faux fur 3 in 1 animal hat is one of the most fun and stylish ways to keep warm in freezing temperatures. Everyone's grabbing one, why not find one for yourself too? As we shiver through the winter months, it's often difficult to look fashionable and cute. There are so many layers - shirt, sweater, coat, scarf - that we resemble snowmen more than anything else. One way to inject a bit of humor into your winter dress, and look good in the bargain, is to don one of this season's hot looks. 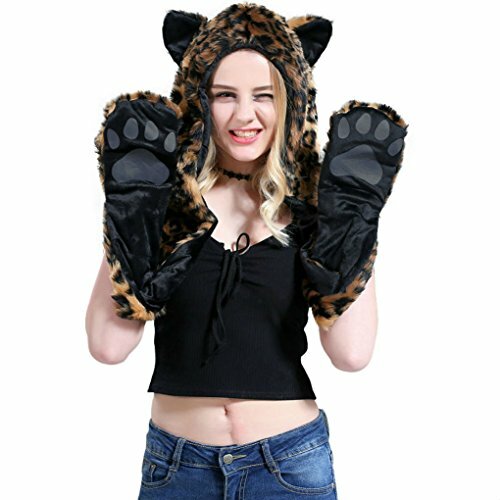 A full animal hoodie is the scarf/hat/mitten combination, which we're beginning to see everywhere! There are many different animal designs. Check them out to see which one appeals to you. They're all good! Ever battled through freezing temperatures envious of the fur coat of the local cats and dogs? They look beautifully warm, while you have nothing but wool between you and the elements. Unleash the animal in you this winter! Kewlwool have come up with brilliant fake fur, 3-in-1 hoodies. They are this season's big item for fashionable winter wear. So much of your body heat is lost through your head that it makes sense to wear a warm hat in winter. They don't get much warmer than Kewlwool's three in one animal hoods. 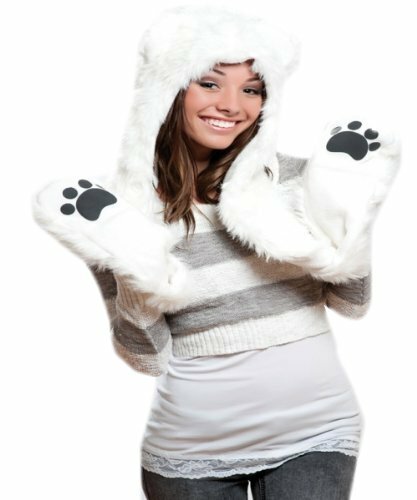 The furry look has been created out of super soft acrylic, with a fleece lining. That's not real fur. No animal was harmed in the making of these fun hats. But it looks and acts like the real thing, keeping you toasty inside. The really cool thing about this hat (and the reason why so many people are opting to buy one) is that it combines all that you need for extra warmth. The hat part buttons underneath your chin to create the scarf, though the model in the pictures is wearing it loose. You could also wrap the long arms around your neck, if you want to be really cosy! At the end of the arms are slots for your hands. They act as mittens! So you won't have to don separate mittens, hat and scarf when you go out. They're all laid on in this single item. Where's that glove? I know that I shoved it into my coat pocket with my hat and scarf. Look! The other glove is right here! There's that awkward delay in the amicable goodbyes, as my host and I search the cloakroom floor. Gremlins obviously abound in there, easing random gloves out of the pockets of good, innocent folk. It usually takes a few minutes to locate the errant item. Then unpause the goodbyes and off we go. You really wouldn't have that problem with the 3-in-1 combo. It's too big to miss and all of the components are attached. Your gloves haven't been so safe since you were in kindergarten and your parents had them tied together, on a length of wool, trapped inside your winter coat. Yet for all of that, it's not bulky to wear. Just warm. She's either very small boned or the photographer's tools have been well deployed. It's a shame, because she's a pretty lady too. She looks great in the first one, but faaaaar too thin in the others... Bizarre what camera angles can do for you. Paul - I thought that! I wondered if it was a different model, but her face is the same. From mad Japanese mushroom chefs to Hurricane Sandy joggers, the horse head mask has become de rigeur animal head wear for the meme conscious connoisseur.